I think everyone and their great aunt Sally has made cinnamon apple sauce ornaments, and why not? They are easy, they smell amazing (I scatter them in the tubs when I pack Christmas stuff away so the next year everything smells like the holidays) and they last forever. (affiliate link) set for a little over $6. From my personal experience, buy a larger set. The tiny letters were finicky, especially if they had internal cut outs (like A, B, R).If you only need a few letters you might be better off winging it free handed. Mix 1 1/4 cups apple sauce and 2 cups ground cinnamon into a thick dough. If it’s too sticky add more cinnamon, too dry add more applesauce. It should easily roll out without major cracking. Roll out to about 1/4 inch thickness. Dust with cinnamon to stop dough from sticking to the rolling pin. Cut out your letters and make a hole near the top with the drinking straw, skip this step with letters that have a hole like D’s and B’s. Bake at 150 degrees for an hour. Cookies should harden and dry as they bake and at this point your whole house should smell like cinnamon. When cookies are completely cool add a twine loop to attatch to a gift or gift bag. They can be reused as ornaments every year. *Optional: add the date on the back in paint pen. What cool ornaments / gift tags! OMGoodness I just had a flashback to my granny… Awesome Recipe. Thanks so much for sharing! These are so cute! I remember making cinnamon dough in school as a kid. It was so fun! How cute. I remember making dough ornaments with my mom so long ago. I bet these cinnamon dough ornaments smell divine. Would love to do this with my kids. These are adorable and I bet they smell wonderful too! I’m slightly raising my hand that I’ve never made cinnamon apple sauce ornaments. Never would have thought to put them in all the Christmas tupperware, I can only imagine the amazing smells which would hail upon next years decorating fest. 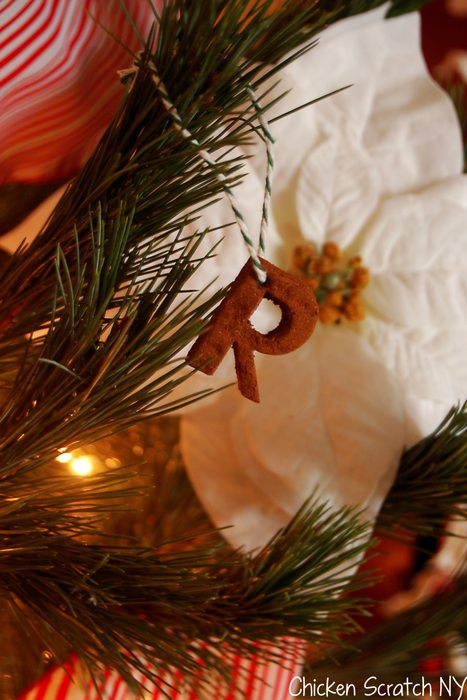 we make the cinn applesauce ornaments but i didnt think to do monograms- i love this idea! This is such a fun idea! I bet those smell divine. I must admit that I have never made those! 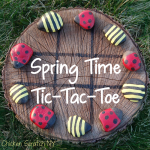 Adding it to my holiday list – what a fun project to do with kids! I feel like the only person who’s never heard to cinnamon dough, but now that I’ve see how cool it is, I’m going to have to make some with our little one! I’ve actually never made cinnamon apple sauce ornaments, but yours turned out so nice that you may just have inspired me! Going to pin this now so I won’t forget! My daughter and I make these every year, but yours turned out perfect! Such sharp edges! Your ornaments look great. I may try making some myself! I’ve seen these done as ornaments, but never thought of it as gift tags. What a brilliant idea! I can practically smell these already. They’ll last year after year too. Love it! This is such a cute idea! I love it. I’m going to pin this so I can try your cinnamon dough recipe. I’ve been looking for a gift my daughters could make for my mom and grandma, they can make ornaments!! Love this..
I’ve been meaning to make these as ornaments for years. Never thought of using them as tags! Love it! What a very cute and original idea! Love this! 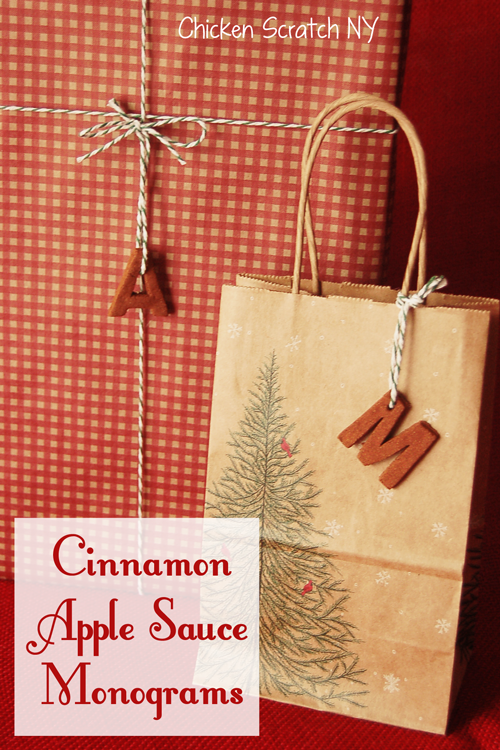 I have seen the cinnamon applesauce ornaments, but have never made these! I love the monograms and maybe it will be enough to get me to making some! what a cute idea – love the scent too! I love this. 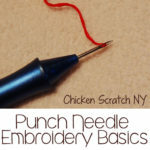 It is such a cute and easy idea. What a neat idea!! Thanks for sharing! We will probably make a batch of dough to play with for sure! It’s great for kids, as long as you don’t roll the dough too thin they are surprisingly sturdy! Not only are these super cute but I bet they good too. This is the neatest thing EVER!! What an awesome gift idea!! Love this idea! We’ve never tried it before.